Quiet Times For the Heart: Revive My Heart! This book contains revolutionary daily quiet times of devotion that can lead students through their time with God, including helpful devotional readings, Bible study, journaling, prayer, worship, meditating on hymns, and application of the Bible to one's life. - Publisher So often the busyness and uncertainty of life crowd God out, leaving us with barren hearts. Truly joyful, abundant life is possible only one way -- through personal spiritual revival. In Revive My Heart!, author Catherine Martin presents nine weeks of daily quiet times that will lead you to investigate the depths of God, His ways, and His character through prayer and consistent study of His Word. Exploring passages such as Psalm 119, Revive My Heart! looks at the many aspects of spiritual revival. Through these daily quiet times you can gain spiritual depth, joy, and access to your heavenly Father's resources in times of trouble. Book jacket. About "Quiet Times For the Heart: Revive My Heart!" So often the busyness and uncertainty of life crowd God out, leaving us with barren hearts. Truly joyful, abundant life is possible only one way -- through personal spiritual revival. 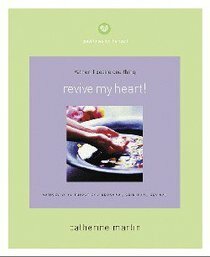 In Revive My Heart!, author Catherine Martin presents nine weeks of daily quiet times that will lead you to investigate the depths of God, His ways, and His character through prayer and consistent study of His Word. Exploring passages such as Psalm 119, Revive My Heart! looks at the many aspects of spiritual revival. Through these daily quiet times you can gain spiritual depth, joy, and access to your heavenly Father's resources in times of trouble. Book jacket.